Rajinikanth Songs From Dharmathin Thalaivan. Rajini Film Songs Dharmathin Thalaivan. Rajinikanth Tamil film is directed by S.P.Muthuraman. Songs from Dharmathin Thalaivan. www.rajinikanth.com. 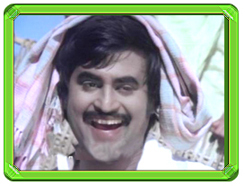 Cast: Rajnikant, Prabhu, Charly, Nazar, Captain Raaj, Kushboo, Suhashini, Discoshanthi, Vijayachanddrika. 16 Vayadhiniley is a Tamil Film id directed by Bharati Rajaa. Casts: Rajnikant, Kamalahasan, Sathyajit, Gowndamani, Bhagyaraj, Sri Devi, Kanthimadhi, S.R.Vijaya, Premi, Gemini Rajeswari. The first thing we notice when we see 16 Vayadhinile is how it has not aged at all. Inspiteof being made more than 20 years ago (the movie was released in 1977), the movie is still fresh.The basic theme still holds true and the dialogs are sharp. The characters - even the minor ones -are well-etched and come alive because of the terrific performances (In fact, Bharathiraja, in adeparture from the norm, diplays the names of the characters instead of the actors during the opening credits). Ilaiyaraja was already famous for his rustic tunes and he further solidifies his reputation here.Senthoora Poove... is melodious and the lyrics perfectly convey the dreams of a youngSridevi. This film revolves around 16 year old Mayil (Sridevi). A vet, a local rowdy named Parattai (Rajnikanth) and an innocent mad named Chappani (Kamal Hassan) are attracted by Mayil. First Mayil is attracted towards the doctor and get seduced; but he leaves her as she's homely. Parattai also tries to seduce her but Chappani kills him. Finally Mayil waits for Chappani who is arrested for the murder.